Summer of ’64, 3 a.m. — way past my high-school curfew — and I’m standing on a highway with my thumb out and a green duffel bag stuffed with big red Plexiglas letters that only a few minutes ago spelled A Hard Day’s Night on the drive-in theater marquee down the road. Beatlemania inspired what seemed like a generation of kids to run out and buy a guitar. Several, like Bruce Springsteen and Billy Joel, became stars themselves. The freewheeling spirit of the early Beatles had a different effect on me. It made me want to have some of it for myself. I couldn’t get my hands on their first movie. So I stole its title. It’s hard to appreciate the love bomb the Beatles dropped on America unless you were around when it blasted just about all of us all at once. It’s never happened again. How could it? Its own mushroom cloud ultimately mutated the musical landscape into the fractured, genre-bending, tribal culture that has made another all-consuming explosion all but impossible. And yet 47 years after the Beatles split up, last month’s 50th anniversary re-release of Sgt. Pepper’s Lonely Hearts Club Band debuted at No. 3. Which is why, at age 75, Paul McCartney’s visit to South Florida is so special. When the new U.S. leg of his One On One tour takes off from American Airlines Arena on July 7, Sir Paul will be as close as we can still get to the first time we heard the Beatles. South Florida was very close once before. Actually, on Feb. 16, 1964, Miami Beach was darn near ground zero. 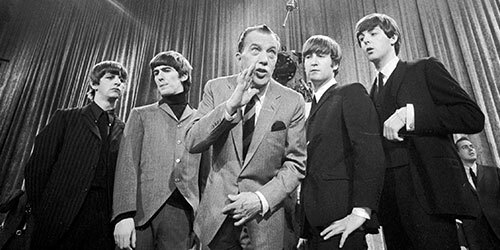 The Deauville Hotel on Collins Avenue already enjoyed a rep as a showbiz hotspot when from a small stage in its Napoleon Ballroom, TV impresario Ed Sullivan brought America only its second live look at the Beatles (and its last on their first U.S. visit). Seventy million people — over a third of the U.S. population — tuned in. Stoked by a couple of days of dress rehearsals, that night the Napoleon Ballroom bulged with a crowd of 2,600. Almost 1,000 angry ticket-holders were turned away, and the mob scene in the lobby kept the foursome from getting to the stage in time. Sullivan had to stall and go to commercial. I’m standing with her on the ballroom stage now, hoping to feel that atmosphere. Just six steps up from the floor, the stage is not quite as wide as a bowling lane is long and only a little deeper than a VW Beetle. Behind its curtain, there is no backstage. There’s only a wall. As I look out across the vacant, chandeliered ballroom, I wait for a sentimental sense of history to wash over me. It doesn’t. All I can feel is bewildered by a colossal, absurd incongruity: that the once-in-a-lifetime, global phenomenon the Beatles would become was launched from this relative speck of a room, on this bandbox of a stage, where on that Sunday night — despite their record-breaking debut on the show the week before — Mitzi Gaynor had top billing. The lads from Liverpool loved it here. They stayed for a week, basking in the sun and fun of a city unlike any they’d known. From their balconies on the 12th floor, they looked down on the beach and read their fan mail, scrawled Miami-style in the sand. Unlike typical vacationers, however, they evaded fans by riding in the back of a rent-a-truck. They sparred with Cassius Clay at South Beach’s 5th Street Gym, working out for his Sonny Liston bout. They toured the harbor on sofa-bed magnate Bernard Castro’s yacht and frolicked at a private Star Island estate. They jumped into the pool of a record exec’s home for a Life magazine cover shoot — and returned the next day for an impromptu party with the residents’ teen-agers. “My brothers came home with some friends. A few brought guitars,” said Linda Pollak in a Chicago Tribune article 25 years later. She was 15 that day. “We cranked up the radio and danced. I remember doing the Twist with someone, so they must have played Twist and Shout. Ringo was clowning around. Paul knew he was the ‘cute one’ and was just being gorgeous. George was quiet, but he and I got into a long conversation about spirituality and India. Almost every month now, it’s someone else. The recent passing of rock luminaries — Berry, Bowie, Frey, Allman — and the spectre of more to come is hitting us in places other than our ears. Which only puts in sharper relief the imperative McCartneyness of McCartney. And yet beyond his vegetarianism, his causes, his classical compositions — beyond being considered the most successful artist and composer of all time — he still evokes the feeling that he’s one of us. Case in point: After witnessing the horror of 9/11 from the JFK tarmac, it was this irrepressible Brit who dove into organizing the Concert for New York City. Possibly except for those whose allegiance was sworn to the Stones — or Lennon — his likeableness, his playfulness, his McCartneyness remain endearing. Having had that relentless good energy with us for over half a decade has imparted, even if subconsciously, a kind of generational comfort. It’s just good to know that there’s still … McCartney. In the middle of the next night after the Hard Day’s Night heist, after realizing I had no idea what to do with those giant, incriminating letters, I dropped them off at the drive-in entrance and sped away. For me, they became two hard days’ nights. Two years later, Beatlemania still held sway when the lads returned to Shea Stadium in New York. From my seat in the very top row, even with binoculars it was hard to make out the four bugs on the second-base stage. Or hear them — the sonic boom of screaming girls obliterated each song. I never heard one. It was madness. Still, best concert ever. No one at the Triple A on July 7 will have those problems. The concert experience — like us — has changed too much. It’s remarkable though that, for all the changes, how we feel about McCartney is pretty much the same as it was the first time we saw him, isn’t it? On the Ed Sullivan Theater stage that screaming Sunday night, just four days before landing in Miami. When he shook his mop top and the world tilted as he detonated those first three words to that first song we ever saw the Beatles sing. PHOTO: Ringo Starr, George Harrison, John Lennon and Paul McCartney with Ed Sullivan at the Deauville Hotel in Miami Beach in 1964.